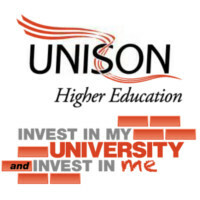 We have now received a "full and final" written pay offer from the national employers’ organisation the Universities & Colleges Employers Association (UCEA). 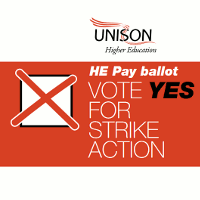 UNISON’s Higher Education Service Group Executive, the union’s national committee for HE, is consulting members on this offer. There are two major events coming up soon organised by the Aberdeen Trades Union Council which we'd encourage all branch member's to attend. The annual May Day March for International Workers' Day will take place this year on Saturday 30th April. All trade unions, community organisations, friends and families are encouraged to attend - bring your banners and placards, and let's make this march the biggest ever! Groups gather at Rubislaw Terrace from 11.00am, for 11.30am march off. The march will progress down Union Street to a rally and speakers at Castlegate from 12.15am. Come along and support this important event! Download the May Day 2016 Poster. 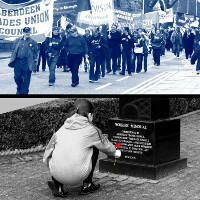 All over the world on 28th April each year organisations hold events to mark International Worker's Memorial Day. The purpose of IWMD is two-fold. 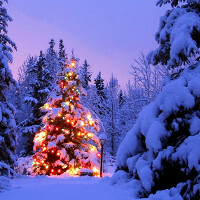 Firstly it is about not forgetting those who have died, been injured, or made ill by their work. Secondly it is about ensuring that this tragic loss and suffering are used to reinvigorate the campaign for healthier and safer work. The campaign slogan is "Remember the dead, fight for the living." The Aberdeen ceremony will take place on Thursday 28th April at Persley Walled Garden, Bridge of Don, Aberdeen, meet at 12.30pm for the ceremony at 1pm. The ceremony will take approximately 30 minutes. Everyone is welcome and invited to attend. Download the IWMD 2016 Poster. The National Executive Council (NEC) has launched a consultation of UNISON Branches about the European Union (EU) Referendum taking place on 23rd June 2016. The information collected from the consultation will be used to assist the National Executive Council in taking any policy and campaign decisions on the EU referendum in the run up to the referendum date. 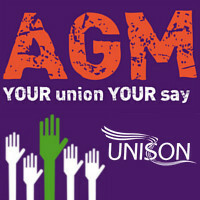 UNISON wants to ensure that members’ voices are heard in this important debate. 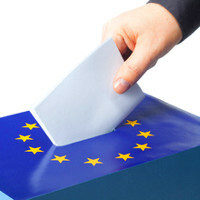 To help with the branch consultation UNISON has provided an Information for Members pack on the EU referendum. This will help members and branches understand more clearly what the issues and implications are when debating whether the UK should stay in or leave the EU and the impact of any decision on UK workers and trade unionists. Branch members have been emailed a consultation survey. If you haven't received a copy please contact us, and we'll send you one. The branch consultation is running until 31st March 2016. It's now time for the branch Annual General Meeting, and this year we're doing things a bit differently, so we hope you'll be able to come along. The AGM will be held on two days at lunchtimes, with one meeting at RGU and the other at UofA. Please make every effort to come along to one of them. Refreshments will be provided from 12 noon and the AGM meetings will start at 12.30pm. Papers and agendas will be sent out to members in advance of the meetings. Please also ensure you complete and submit any nomination forms for stewards and branch officers prior to the meeting.